Product Features： ｡ Supports a variety of high-power transmission speed. ｡ Support Port: USB3.0/USB2.0/USB1.1 ｡ Tailored to each port 500mA output current exceeds the current detection and protection ｡ 32 - bit 33 MHz PCI interface to support up to 127 devices in an industry standard. ｡ Hot-swap and wake-up support equipment Supports win2000 win2003 winxp vista32 vista64 Win7 Description： The product chip PCI USB 3.0 card, the maximum can reach 4.8G / S, support full-duplex digital communications, providing faster transmission speed chip quality assurance, and better compatibility. Through the computer's PCI-E interface, USB3.0 interface, the most effective way to slot expansion. Installation fast, easy to use, high transfer rate, allowing users to a USB In the keyboard, mouse, electronic drives, printers, digital cameras, scanners and other devices access to computer interfaces at the same time. Its most obvious feature of this approach is to support USB2.0, USB1.1. Characteristics： compliant with usb 3.0 specification revision 1.0. supports Low-speed(1.5Mbps)/Full-speed(12Mbps)/High-speed(480Mbps)/Super-speed (5Gbps). Supports 2 downstream ports for all speeds. Supports all USB compliant data transfer type as follows;Control/Bulk/Interrupt/Isochronous transfer. Compliant with Intel is extensible Host Controller Interface(XHCI)Specification revision 0.95. Support USB legacy function. Compliant with PCI Express Base Specification 2.0. 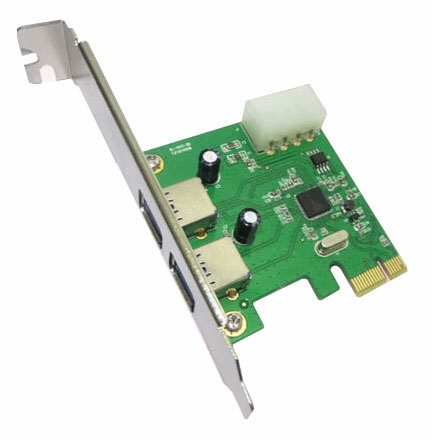 Supports PCI Express Card Electromechanical Specification Revision 2.0. Supports PCI Bus Power management interface specification revision 1.2. Supports external power socket in order to supplying power for each USB 3.0 connector up to 900Ma Max/port.